There’s nothing like a Barolo tour at harvest time! Alba is the white-truffle capital of Piedmont, and every October truffle season kicks off with a medieval festival and artisan food fair. After a pick-up at the Tortona train station, we'll shuttle to our hotel in Alba (1 hour). A welcome lunch introduces Piedmont cuisine, then it's on to the medieval festivities! These include a colorful parade of a thousand costumed locals, followed by the day's centerpiece: the donkey race or palio, a comedy of errors which dates back to Alba's defeat by Asti in 1275. Afterwards, there's time to roam the food & food fair and taste samples of mountain cheese, salumi, wine, chestnut honey, and nougat candy. Today begins in Monforte, the township where the most robust, long-lived Barolos come from. We’ll visit Conterno Fantino. Here you’ll get a sense of Barolo’s typical boutique winery: family-run, with the owners living and working on the same property. You’ll taste some exception wines, including several single-vineyard Barolos and possibly some stellar whites (if they’re not sold out). Lunch is your choice, but we could go to your guide’s favorite spot in Barolo, Cantinetta Barolo, where one can order a parade of classic piedmont appetizers, such as vitello tonnato (veal with delicate tuna sauce), served family style. Afternoon takes us to another boutique, family-run property, GD Vajra. In contrast to this morning, this winery is on the western ridge, meaning the place where Barolo’s more perfumed, feminine side shows itself. Then if time allows, we visit the Castle of Grinzane Cavour. Now a museum, this was the home of Italy’s first Prime Minister, Camillo Benso, Count of Cavour. Like an Italian Thomas Jefferson, this politician was equally adept at wine and became a seminal figure in the creation of Barolo in the 1800s. Dinner features more piemontese fare. We’ll look for agnolotti (a variation of ravioli) and bonnet (chocolate-amaretti pudding) on the menu. ﻿Don your walking shoes! This morning we stroll through hazelnut groves with Carlo, a truffle hunter and his dog. We’ll see how canines are trained to sniff out the precious tubers, which grow beside certain tree roots, and hear why they don’t use pigs anymore. Then it’s on to another top Barolo winery, Damilano, whose wines have consistently offered an exceptional price/value buy. Here we’ll be able to compare Barolo single-vineyard cru side by side—always a fascinating exercise. For lunch, we drive to higher elevations in the Alte Langhe. Too high for grape-growing, this is cheese country. Our buffet lunch is at a Murrazzano cheese farm, where we’ll have a tour, then feast on freshly made mountain cheese, salumi, fruit, and light-as-air hazelnut cake. The afternoon takes us back to Barolo. 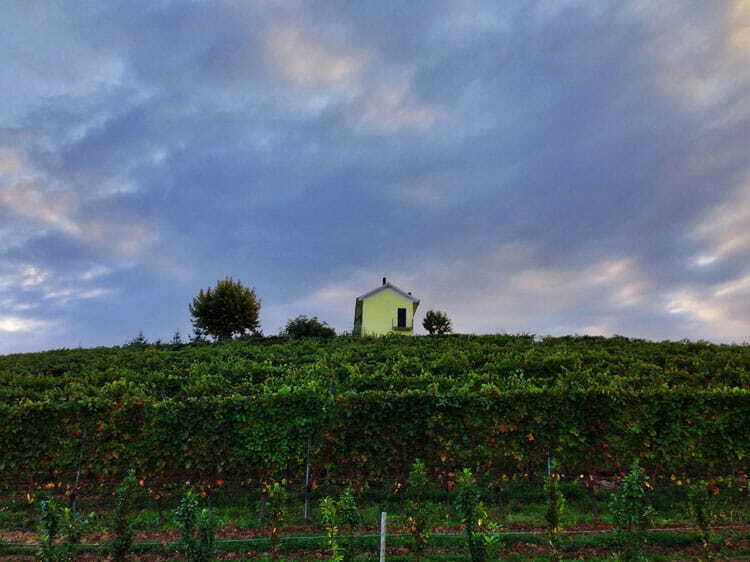 Our winery is on a boutique scale, but gets the big scores: Silvio Grasso. Grape-growers since the 1920s, the Grasso family began bottling their own wines in the 1980s. Our gracious host, Marilena Grasso, will pour an array of Barberas, Barolos, and Super Piedmont blends. But most fascinating will be the side-by-side comparisons between cru and vintages. Dinner is on your own in one of Alba’s many fine restaurants. Today we focus on Barbaresco. More perfumed, elegant, and supple than Barolo, Barbaresco is considered the queen to Barolo, the “king of wines and wine of kings.” We’ll visit one of the largest, most historic Barbaresco producers, Marchesi di Gresy, which makes several cruas well as a rare (and very good) Piedmont sauvignon blanc. If we’re lucky (and we usually are), the cellar master (a New Zealander!) will pop in for a hello and a chat. En route to Gavi in southeast Piedmont (1 hour drive), we’ll stop in the hills above Tortona, where the timorasso grape grows—a favorite of the Slow Wine movement. You’ll get acquainted with this versatile white grape at the family-run La Colombera winery. Next, we continue to Gavi. Our hotel is a beautiful restored villa a few miles outside of town, surrounded by quiet grounds. Dinner is in the vicinity. After lunch, we visit the town of Gavi for coffee. Here shop windows proudly display Gavi di Gavi wine, fresh ravioli, and soft, puffy almond cookies—a local specialty. But you won’t find a single postcard or touristic t-shirt here. Being off the beaten track, Gavi is an unadulterated, locals-only Piedmont spot. We’ll also visit the grounds of the Fortress of Gavi, a massive 11th C. fort perched high above the town, which once guarded the salt roads leading from Genoa to Milan. Afterwards, we’ll have a tour and tasting at either Villa Sparina or the boutique Il Poggio. Our farewell dinner spotlights more Gavi di Gavi wine. Want other Piedmont options? Check out the wine-intensive Xtreme Piedmont and the 3-day mini tour Trufflemania. If you'd like some exercise along with your wine, see our Piedmont & Cinque Terre Trails wine & walking tour. 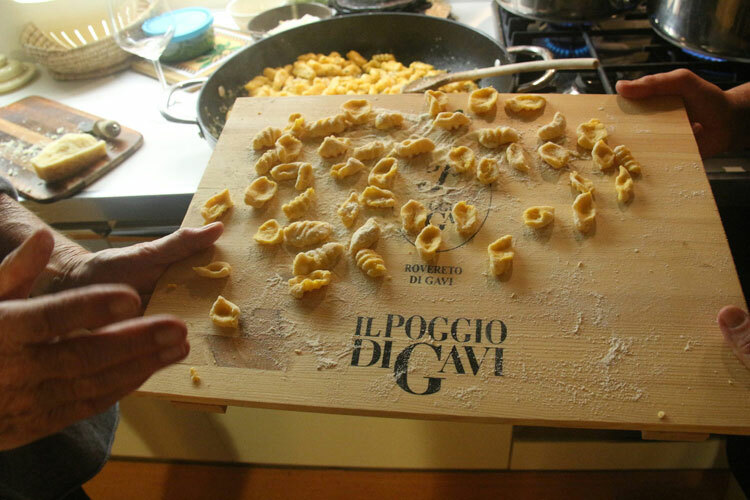 Finally, Slow Food Festa is custom foodie/wine tour in Parma, Modena, and Piedmont. On our final day, we’ll shuttle you to the train station of Arquata Scrivia. The station is about 7 miles from the hotel, so we can offer a choice of two shuttles: either early in the morning to catch the 8:20 train to Milan, or later that morning to catch the 12:30 train. During the tour, we can help you buy your return train tickets. When packing, check www.weather.com. Go to "Asti, Italy" to get a general idea of temperatures and forecast. In July, expect summertime temperatures, with comfortably hot, dry days (85º average) and cooler evenings (65º). In October, it's jacket weather: Fall will have commenced, with morning mists, an equal chance of overcast or clear days, with the possibility of sporadic rain. Average daytime temperatures are 60º, and 45º at night.